Nadal handed time violation – before match! The world number one was preparing for his Wimbledon second round match against Kazakhstan’s Mikhail Kukushkin on Centre Court. 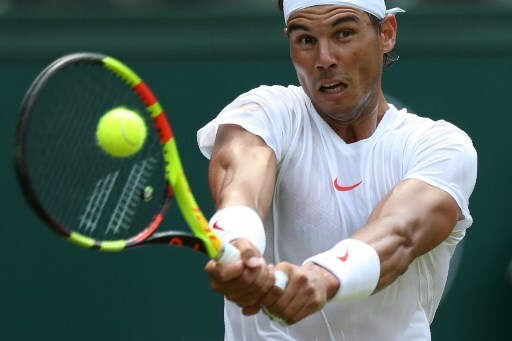 Rafael Nadal has become used to getting sanctioned for slow play, but on Thursday at Wimbledon he was warned for wasting time before a ball had even been hit in anger. However, veteran umpire Carlos Bernardes issued a warning to the 17-time Grand Slam title winner who was still sitting on his courtside chair. “I didn’t know but I don’t see a clock here. I don’t see that countdown. It’s more difficult for me to understand what’s going on,” said the 32-year-old Nadal after his 6-4, 6-3, 6-4 win. Nadal was warned again by Bernardes before the start of the third set. “That’s normal. I was slow at that moment. I know I had to take the wristband, T-shirt, banana out, change everything,” explained Nadal. “Probably I should go to toilet. If I go to the toilet, I had plenty of time to change everything without the time violation. I decided to stay on the chair. “I was slow enough to receive a time violation. Yeah, I accepted. That’s all. I think I was very quick during the match. Thursday’s incidents are not the first time that Nadal and Bernardes have clashed. In 2015, Nadal asked for Bernardes not to officiate at his matches after an incident in Rio de Janeiro over the Spaniard’s shorts. Nadal had arrived on court with his shorts on back to front but he was told to change them on court. Despite that bizarre argument, Nadal insists he does not have a personal issue with the veteran umpire. “For me personally that was disrespectful,” he said. “I put my shorts on the other way. You cannot force me to change my shorts in front of everybody, you know. For me, that’s not respectful. “I respect when I am slow, I accept the warnings. I do my best to be quick.